During the late 1990’s, power metal came back on the scene, thanks to bigger labels taking a chance on bands like Hammerfall, Primal Fear, Stratovarius, and Kamelot and making an impression first in Europe – and eventually all across the world. Hollow from Sweden were one of the outliers who made quite an impression critically with their debut Modern Cathedral in 1998 as well as the follow-up Architects of the Mind the next year on Nuclear Blast. 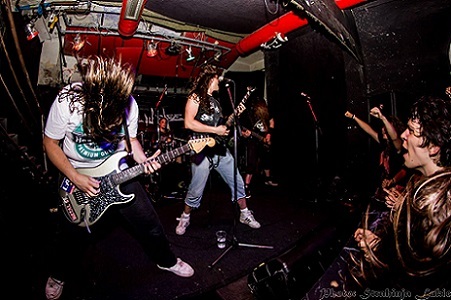 Just as quickly as they came, they vanished from the scene – although vocalist Andreas Stoltz developed a new progressive power metal band with Binary Creed who’ve released two albums to date. 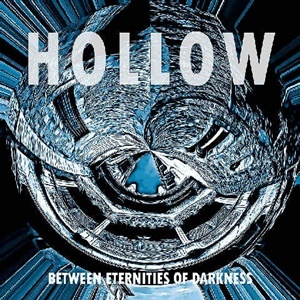 Feeling the need for a third full-length, Andreas resurrects Hollow for Between Eternities of Darkness – tackling all the instrumentation and vocals outside of the drums, handled by Stalder Zantos. The eternal question lingers before pressing play – will these ten songs remind listeners of their previous discography, or take a new direction almost two decades away from the scene? After a few passes, it’s evident that Andreas wishes to bridge the past with the present in terms of the songwriting and execution. There’s no deny the strength and character for his vocal delivery – it comes from his lifelong passion of metal and has many moments that create chillbumps within the Candlemass-esque opener “Travel Far” or the solemn acoustic to electric ballad “Shadow World”. Occasionally the riffing and choruses ride down into more modern tones and simpler pastures – “Down” the clearest example of groovier measures along with a repetitive ‘down, down, down’ refrain boiling things to a common denominator. Stalder gets a chance to prove his worth during “Hidden” – juggling some progressive tempos and double kick versatility against the crunchy foundation to make this an exciting anthem as Andreas flexes some potent power/doom riffs and supplementary accents for texture. Hollow hasn’t taken a hard left turn from their past – it’s quite heavy in the power / progressive spectrum, allowing for the occasional clean / calmer passage to set up the subsequent energetic lift vocally and musically. Best tracks include the Tad Morose-like “Calling” and the abundant vocal-harmony closer “Say Farewell” – the latter featuring some uncredited female assists that add to the dramatic roller coaster nature of this 3:36 arrangement. Between Eternities of Darkness is probably a little more straightforward in terms of the basic structures and transitions, but still sits in that Hollow power/progressive style, heavier than typical ‘uplifting’ bands looking for racing keyboard/guitar duels and choir-like audience interaction. Maybe this will resurrect the band for some live performances and a full reunion for another album – solid stuff for sure.